Sarah Winnicki is the Research Operations Manager for the Sabeti Lab. She manages and assists with bench level experiments relating to viral genome sequencing. Sarah coordinates and trains research technicians in the lab as well as collaborating scientists in both West Africa and the US. Sarah is also the lead instructor for the ACEGID advanced sequencing course. Sarah began in the lab executing functional follow-up studies on TLR5, a gene that the CMS method identified as being selected in the human genome (Grossman et al. 2010; Grossman et al. 2013). 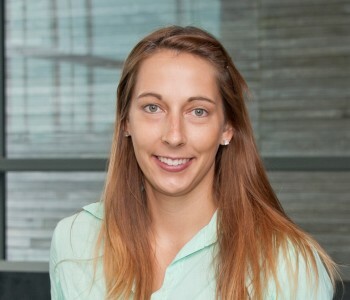 She has also worked on the Massively Parallel Reporter Assay being developed to identify causal alleles driving positive selection signals and loci identified from genome wide association studies (Tewhey et al. 2016). More recently she has worked on previous and ongoing viral sequencing projects including Ebola, Zika and Lassa Fever. Sarah obtained a B.S. in Aquaculture and Fisheries from the University of Rhode Island and a M.S. in Marine and Atmospheric Science from Stony Brook University. She completed her Master’s thesis on the interactions between the parasite, Perkinsus marinus, and its oyster host, Crassostrea virginica. When not making sequencing libraries or extracting viruses, Sarah can be found visiting the RI shoreline, on Long Island tasting wines or enjoying local food spots around Cambridge and Boston.